Yesterday I went to the park to enjoy the day. It was such a beautiful day, so I figured I would make the best of it and figure out a way for me to get things done while enjoying the sunshine. I had quite a few emails so I decided instead of answering them on the internet (because I hate typing) that I would get the camera and go down to the lake and just answer the emails there. 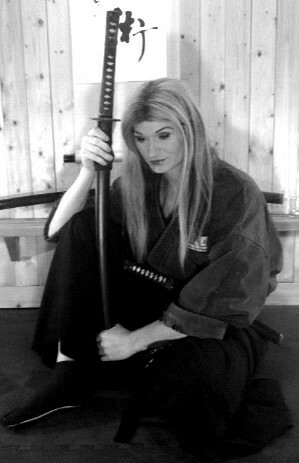 I was a wonderful time, the emails were great too with many compliments and questions about training with the Budo Ryu I sat there and answered the emails for about 45 mins, till my battery ran down. I will get this video up and published on the website so that you all can see it as well! (I will warn you the wind was really bad, so some sections you might not hear me that well). I needed to get work done, but still wanted to enjoy nature and the day. Happiness is what we are all looking for. Do what you can do to make yourself happy, at the end of the day, that is all that we have. Happiness and love helps you see things clearly, Hate and revenge clouds your vision. It was said that hate is like a double edge blade, as you cast it on the people around you, you are also cutting yourself with it as well. Remember that Budo is not about being better than anyone else. It is about being better than what you were yesterday, and if you are not in balance, if you are not happy, you cannot help others become happy. I hope that this helps you today as well as your training. Everyone of us has a essence, a soul and a spirit that resides within. This spirit is what drives us to be who we are. The physical realm changes as we change through life, when you are a little one, you look as such, when you become a teenager, to adult, you take the form of where you are mentally as well as spiritually. This is so that you can show the world who you are on the inside, and express with the others around you. Some of us do many things to change our outward image to reflect who we are, such as change the color of our hair, get tattoo’s and body piercings, etc, etc. This list goes on and on, fact is everyone does these and changes the outward image to show to world or reflect the inner spirit. When your body matches your mind and your mind matches the spirit, you have taken the sanshin (mind, body and spirit) and made them one, only at this time can you have complete happiness, control of oneself, a high level of self-esteem and awareness which leads to a positive self-expression. In life we learn that nothing stays the same, that everything changes. As you change, as you age, you need to maintain that same level of balance in your life, letting your physical form match that of how you feel with the mental and emotional forms to maintain that balance within. NO BODY — “fits in” — hell; we are all misfits in some realm or another, but the facts are that we are all human, we all have feelings and we all strive to have balance and happiness in our lives. For this reason alone, no one person on the face of this earth should be judged by their gender, race or religion as all of these things are just emotional outlets to help maintain the balance and happiness that we all seek. I know today that you probably wanted me to talk about the martial arts and fighting techniques, zen and mental clarity. And although that is usually what I talk about, if you take all of that one step further we are all doing these arts for the same reason, to be happy. Does it really matter what martial art someone does as long as it works? And when I say works I do not mean hurting another person, I mean bring the practitioner happiness and outlets towards self expression as a person. It should not matter, martial arts is just the vehicle that you use to get you from “A” to “B” and “B” is the destination. As long as you find happiness doing the arts, that is what is of importance, not what “style” that you practice, because the facts we are all different people with different feelings, no one art can truly relate this to every person who practices the martial arts,..this is why I have always said the person is always more important than the art, without the person, the martial arts do not exist. Whatever martial art you choose to do, do so with complete balance of the Sanshin. Whoever you choose to be, do so with the complete balance of mind, body and spirit. You have the right to be happy, and only you can make yourself achieve that happiness. I hope you all enjoyed the lesson today.